Do you still remember the land between being a child and a young adult? The year or so just before puberty? 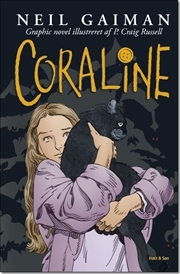 Yes, this one is for kids, Neil Gaiman’s Coraline. And yes, you all read it, I know. But darn this was a scary read for this adult reader, and I felt like I was back in that land again, mentioned above. Originally this is a novel, I am aware of that, but I read the graphic edition of it, adapted and illustrated by P. Craig Russel. Oh my…it was scary! I have to say that again. Coraline and her slightly distanced mom and dad have just moved into an old house, which they share with other tenants. Coraline is bored, and her parents doesn’t really help, only by suggesting boring things to do. They are not unloving, her parents, but seem more occupied with their own stuff. Just like I myself felt at that age (and maybe did at least until a year ago where my father died). So when Coraline discovers a door leading nowhere, her curiosity is immediately on high alert. Finally something is happening. Even though she is told not to bother with the door, she still goes on and opens it one evening. And she is suprised. Behind the door is a parallel apartment just like her own. With a set of parallel parents. Even the other people living in her “real” house are there in their parallel “edition”. At first it seems like a more ideal place to be. But only at first. Because something is off in a very bad way, and Coraline is quick to discover that when her first surprise has settled. This graphic novel was full of gothic mysticism, and even though I was not breathless over the drawings, I was chilled, literally chilled, reading this story. So in one way or the other the drawing did have an effect on me. Those drawings – and the magnificent story of course – must have an even greater effect on a kid. Or maybe not…? Perhaps Coraline’s story is way more chilling for adults than for children? I don’t know. I haven’t read the “real” book, so I have no idea how close the graphic novel is to the original, but is you like a gothic story as much as the next person, I definitely recommend this one. I haven't read the novel, but I saw the movie, and it was suuuuper creepy, too. I am kinda intrigued by the graphic novel version. I read the novel version.